Exfoliating scrubs are one of my favorite weekly spa rituals. It's only fitting, then, that spas and tanning salons such as Los Angeles-based Chocolate Sun would create their own line of body care. 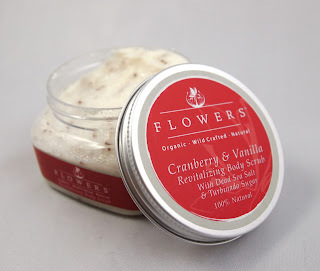 Below is my review of their Flowers Revitalizing Body Scrub in cranberry and vanilla. Flowers Revitalizing Body Scrub uses both dead sea salt and turbinado sugar to gently exfoliate. This combo is effective but slightly more gentle than I expected. The scent reminds me of cherry candies and leaves a nice, light fragrance. Vegans should note that this scrub claims to contain no animal products (glucono delta lactone is usually derived from corn). The rest of the formula is fairly gentle as well. While Chocolate Sun expects to have online ordering available soon, this product can be purchased by calling the company directly at 800-350-0980. Unfortunately, I don't have access to pricing information at this time. Overall, it's a nice scrub with a pleasant scent and I enjoyed using it.